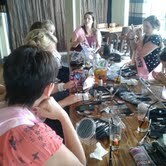 What a way to start your hen night! Take the pressure of yourselves and let our trained make up and hairstylists show you the ropes and transform you into Pin Up Beauties. Then all you have to do in slip into your little vintage dress and paint the town red, as well as your lips!